Strive to achieve those big dreams for our lives, which can seem unobtainable when we have kids and mortgages and greater responsibilities. Have you ever dreamt of becoming an author? This writer did. And, though it didn’t go exactly how she expected, she’s achieved her dream. Some of the most inspirational stories come from people whose dreams have come true. 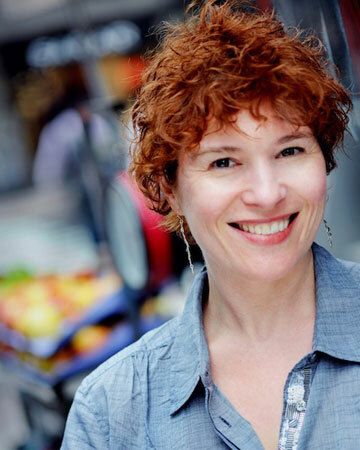 For Debbie Koenig, a mother of one and food writer who writes Words to Eat By, that moment came when her cookbook, Parents Need to Eat Too, was published last month. “I don’t remember a time when I didn’t want to be a writer,” says Koenig. I recently caught up with Koenig to chat about her new book, her dream and what’s next. SheKnows: Tell me a little about your dream of being a published author. Debbie Koenig: I majored in creative writing in college. After I won the fiction prize at graduation, I figured I’d have a short story in The New Yorker before I was 25, and a novel published before I was 30. That didn’t exactly work out. Instead, I spent 15 years working around authors in book publishing before I burned out and left in 2002. Ten years later, my first book has finally come out. It’s not a novel, obviously, but each chapter of the cookbook opens with a personal essay. I agonized over every word, just as I did with my fiction. Every time I catch a glimpse of the cover now I get a little giddy — after all this time, someone believed in my talent enough to publish my book. Not the Great American Novel, but something with value all its own. SheKnows: What road blocks did you encounter? How did you get around them? DK: I was my own biggest roadblock — when my first submissions were rejected (or worse, ignored), my confidence drooped, and drooped some more, until it landed down on the subway tracks with all the rats and garbage. I became convinced that my early success had been a fluke. I didn’t write a word that wasn’t work-related for my last 10 years in publishing, and for a long time I thought that was my true calling — I was really good at marketing other people’s books, and I was running a department with a dozen people in it. But once I left that world, writing for pleasure came right back to me. My plan was to open a gourmet shop, but in the time it took for me to learn the ropes from my mentor (and discover I did not, in fact, want to own a shop), I started writing daily again. This time, about food. 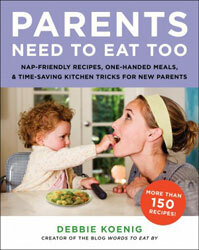 SheKnows: What was your first reaction when you realized Parents Need to Eat Too was going to be published? DK: Relief. Enormous relief — someone other than my immediate family appreciated my work enough to publish it! I cried on the phone with my husband, and again with my mother, and hugged the cat, and did many little happy dances around the room. That exhilaration lasted a few hours, until I thought about the huge amount of work ahead of me. Selling the book wasn’t the end — it was only the beginning. SheKnows: Your book was recently released, and it’s being talked about a lot right now. What’s next for you? DK: The response has been wonderful. Not only do people connect to my voice, but they’re finding the book to be genuinely useful. Those first few months of new parenthood are so challenging! I’m thrilled to think my work will help people, and I hope to keep doing it. I have an idea for the next book, a sort of natural progression from one stage of parenting (and cooking) to the next. My agent is on-board — now I just have to write the proposal and cross my fingers that my publisher is, too. SheKnows: Do you think you will ever return to fiction? DK: I do. Someday. Even though I spent more than a decade away from writing fiction, when I left my publishing job one of the first things I did was join a workshop. I was working on a novel –about a caterer, naturally. The food descriptions were as fully developed as the characters! I stopped when I realized I needed to make money at my writing. I couldn’t afford to wait for that “someday” when I might sell the novel. I’m sure I’ll pick it up again when Harry’s older, when I don’t feel like I have to sacrifice spending time with him to do it. Writing fiction feels inescapable to me, regardless of whether I ever publish a novel. It’s part of who I am, even when it’s on the back burner.